I’m InTouch v10.2 is now Available!! Customer feedback is always the #1 priority in the continued improvement of our I’m InTouch service. Recently many computers come with more than 1 graphics adaptor. In this newest v10.2 we have included support for computers equipped with 2 or more graphics adaptors. Don’t leave for holidays without installing the latest version of I’m InTouch. Are You Ready for the Quantum Age? 01 Communique has quantum-leaped to research and develop leading edge Post-Quantum Blockchain (PQBC) solutions for enterprises of all sizes. Our PQBC technology is designed to operate on classical computer systems while at the same time are secure enough to safeguard against potential cyber attacks from quantum computers. Our new technology will also benefit the current users of our remote access products, making their remote access post-quantum safe as well. We will constantly update our website about the exciting status of our product release and availability of a free demonstration. Stay tuned! as we know today, including blockchains. life span) to crack such mechanism even when using a super computer. the cloud or even owning one, then it will be too late. edge Post-Quantum Blockchain (PQBC) solutions for enterprises of all sizes. and availability of a free demonstration. Stay tuned! 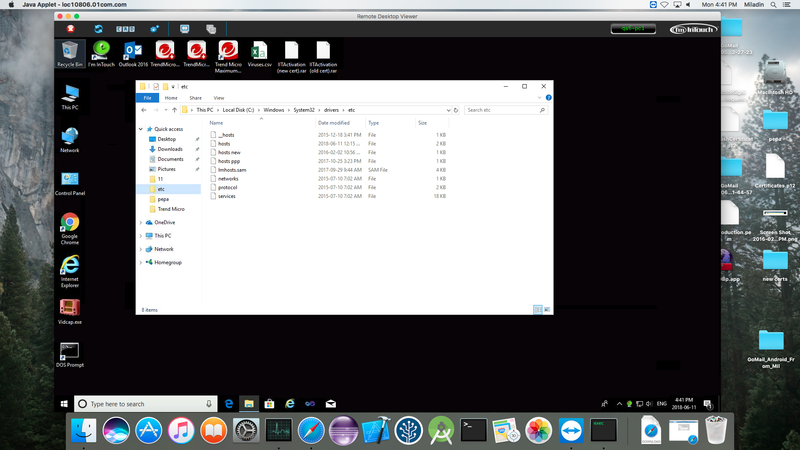 The latest version of I’m InTouch (v10.1) has included a Java client so that users on a Mac computer can also remotely control their Windows PC via a Java interface. In addition, this latest version of I’m InTouch has also included a very handy feature allowing users of I’m InTouch to change their Computer Name remotely. Can I be alerted only on important emails while not bothered by numerous unwanted notifications? YES!! I’m InTouch gives you this magical touch!! Traditional mobile email apps are “All or Nothing” in their notification features. This means either you will not be alerted when an important email has come in or you will be bothered by numerous unwanted notifications. I’m InTouch allows you to set up an intelligent “hot list” of email addresses or domains. You will only be notified when you have received emails from those on the “hot list”. When you hear a notification, with a single click on your mobile device you can open and read that important email on your Outlook at the remote PC instantly. Put it simple, with I’m InTouch, you have the peace of mind that you won’t miss any important email while on the go. Yet you won’t be bothered by numerous unwanted notifications. You PC with Outlook must have I’m InTouch installed. You also need to download the free app I’m InTouch GoMail on your mobile device on which you wish to receive notification. 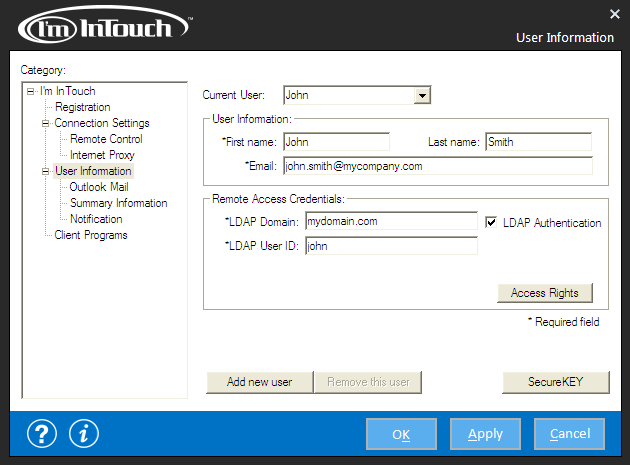 With the latest version of I’m InTouch (v10.0) that has added the support of LDAP authentication, enterprise users with central authentication infrastructure (e.g. Active Directory) can now choose to authenticate their I’m InTouch remote control sessions by attaching to the central authentication infrastructure. IT Managers can change the I’m InTouch remote access credential of any user when necessary such as in the event of staff leaving. We are committed to provide our customers with products that have the highest quality and security. If you have forgotten your account login password, a “Password Reset” mechanism is provided to help resetting your password. Our new “Password Reset” mechanism will authenticate you by asking you to answer a secret question on top of a CAPTCHA challenge-response system. Upon a successful authentication, an email with a link to reset your password will be sent to your designated email address. Thanks to I’m InTouch GoMail!! “I went on a cruise trip to the Bahamas during the holidays. While relaxing at the pool facing the ocean, a beep came in notifying me that I had an incoming email. Since I’m InTouch will only notify me when email arrives from my important customers, I opened up the email realising that I had forgotten to send an important PDF to my client before the holiday. I replied via I’m InTouch GoMail and attached the PDF file from my office computer. DONE!! Very little cellular data has been used since I’m InTouch GoMail basically instructed my Outlook in my office PC to do the job. The PDF file was also being sent from my office PC without having to upload it to any third party cloud. This has not only reduced data usage (which is outrageously expensive on a cruise ship) but also made me feel secure with maximum privacy. I can really enjoy a long vacation with the peace of mind that I can still handle emergency matters remotely with I’m InTouch”. Alex P (Tampa Florida 2017-01-06). Stay InTouch During the Holiday!! Get I’m InTouch and its perfect companion free apps of I’m InTouch Go and I’m InTouch GoMail for your staff in time for the Holidays. 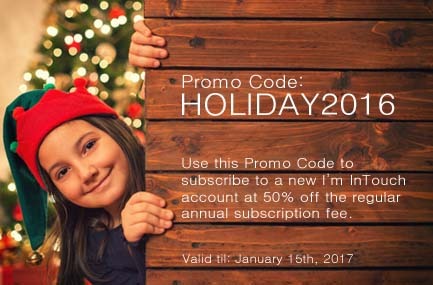 For a limited time we are offering 50% off on new annual subscription. Simply enter the Promo Code: HOLIDAY2016 when you subscribe. This Promo Code expires on Jan 15th, 2017 . Tired of Receiving Notification of Junk Mails? 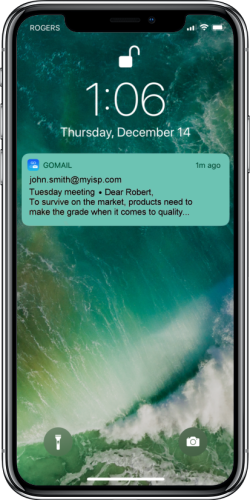 If you are one of the hundreds of millions public email users who want to be notified whenever an email arrives but are tired of receiving notification of those Junk Mails or unimportant messages, you should try our I’m InTouch GoMail free app for iPhone and Android devices. Make no mistake. Notificaiton is a great feature because you want to know immediately when an important message arrives. However, no email filter is perfect so your inbox is always filled with important messages along with unimportant ones as well as some junks. Enabling notification to your mobile device means you will receive a beep whenever something arrives into your inbox whether it’s an urgent one or not, or even junks. 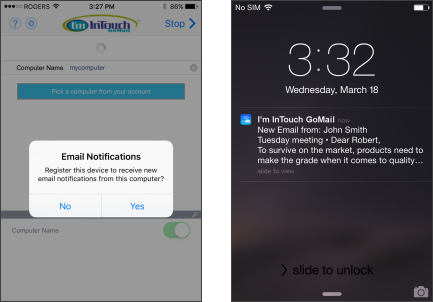 I’m InTouch GoMail allows you to setup a “notification list”. It actually verifies the sender’s address in the Inbox of your Outlook and intelligentlys send out notification only if the address is in your “notification list”. For example, you have entered “my.customer@iitlink.com” onto the notification list. Then only messages sent from this email address will trigger a notification to your mobile device.